Why did you start knitting? Was it to make enough dishcloths to fill your kitchen drawers? Was it to give every person you’ve ever met a scarf? Or was it to make fabulous and unique garments that fit YOU? Sweaters, socks and other garments are a labor of love—it takes hours upon hours of hard (albeit fun!) work. So tell me—how do you feel when you’ve completed a sweater, let’s say, and it doesn’t fit? I’ve heard every excuse in the book for not swatching. But they’re just that—excuses! Excuses like . . .
“I always get gauge.” Sorry, I don't buy it. There’s just no way you knit at the exact same tension as every single knitting pattern designer, in any given yarn, on any given needles. Nope! “It’s too much work.” If you can spend 40 hours knitting a sweater, you can spend 1 teensy extra hour (tops!) knitting a swatch to make sure your sweater fits! “Swatches lie.” Worked and measured correctly, lying swatches are rare! You know what they say—"if you fail to plan, you plan to fail." A well-knit swatch is an essential part of any knitting project plan. But maybe that’s where you’re hitting a snag—you’re not quite sure how to knit a swatch that will do what it’s supposed to do! And you're not alone. Swatching is a mystery to many, both new and experienced knitters. But that's no reason to let the dreaded "S" word stand between you and the sweater of your dreams! So, what's a swatch-averse knitter to do? 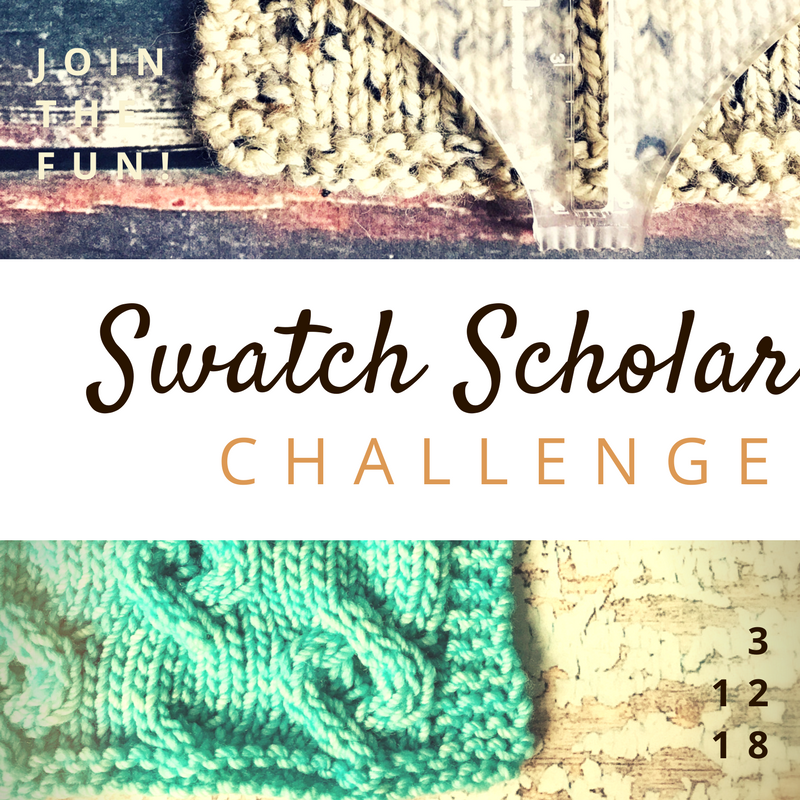 Join me for the 5-day Swatch Scholar Challenge--it's back for 2018! How does it work? Every day for 5 days, you’ll receive an email from me with the day’s lesson. FREE. Easy peasy lemon-squeezy. What’s in it for you? A great fitting wardrobe, of course! And also, PRIZES! Intrigued? Ready to learn more? Click here!